The big news for the 2019 model of the Ford Mustang is the all-new Bullitt trim. No, that's not a typo but an homage to Steve McQueen's role as Lieutenant Frank Bullitt. Sure, Mustang still the other trim levels, from the base Ecoboost Fastback all the way up to the Shelby GT350. But car enthusiasts are up in arms for their chance to try the Bullitt's new 5.0-liter V-8 engine. This Mustang special edition model hits the numbers that make sports car fans salivate--475 horsepower. 420 lb-ft of torque. Top speeds of 163 miles per hour. But there's probably a number you haven't heard yet that'll determine whether the Bullitt ends up in your own garage. The 2019 Ford Mustang Bullitt is the top tier for the model and starts at $46,595. But that's not actually the most expensive trim. That honor goes to the Mustang Shelby GT350, expected to sell for somewhere in the vicinity of a whopping $65,000. Comparatively, the Bullitt seems downright affordable. And if that's all out of your price range, not to worry. The Mustang comes in three more trim levels: EcoBoost ($25,845), EcoBoost Premium ($30,860), and GT ($35,355). The Mustang will meet you at several price points. Needless to say, it's a lot nicer the higher you go. The Mustang EcoBoost offers a 2.3-liter turbocharged inline-4 producing 310 horsepower and 350 lb-ft of torque. Upgrade to the EcoBoost premium to snag an assortment of tech options, like SYNC 3 infotainment, 8-inch touch screen, Apple CarPlay, Android Auto, nine-speaker sound system, satellite radio, leather-trimmed seats with heat and ventilation, ambient lighting, aluminum foot pedals, and pony projection lamps. If you just gotta have a V8 engine, the Mustang GT trim is the way to go, generating 460 horsepower and 420 lb-ft. of torque. What's So Special About the Mustang Bullitt? Steve McQueen famously chose an affordable American sports car as his vehicle for an iconic chase scene in Bullitt. That famous car was a green 1968 Mustang fastback and the film cemented the Mustang as the everyman's cool car, one that the average person could actually afford. The movie was 50 years ago. The 2019 Mustang Bullitt is a way of looking back while looking ahead, an attitude that Ford has embraced with the iconic Mustang for years. 2019's Mustang of choice doesn't skimp on the RPMs, revving all the way up to 7400-rpm, slowly changing its purr to a racecar shriek. Under the veneer, the Bullitt is a souped-up GT fastback (as opposed to a convertible, which the Bullitt doesn't come in). Ford replaced the standard engine with a more powerful one that produces 15 extra horsepower, upgraded the suspension, and added leather-trimmed seats with dark green stitching and a 12-inch all-digital instrument cluster. The better engine and suspension are the real selling points, as is the fact that it's just so cool to own a limited-edition Mustang named after a McQueen character. 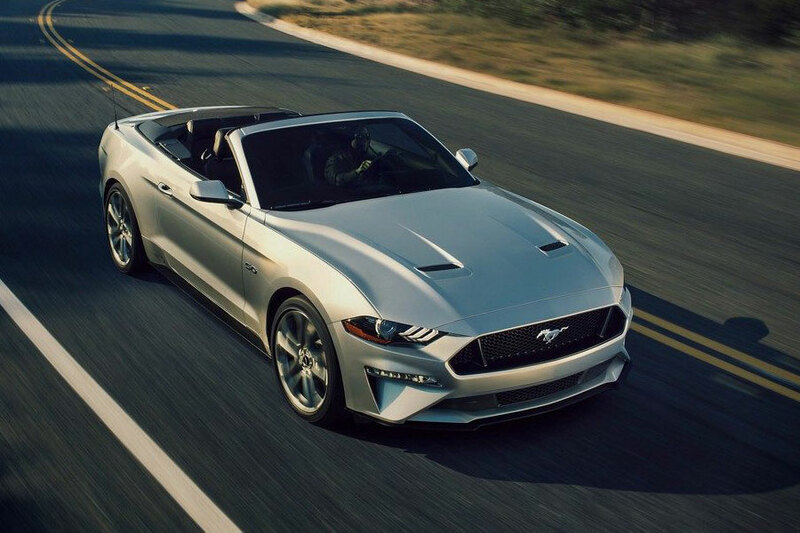 Ford continues to impress us with the 2019 Ford Mustang. We look forward to seeing what the Shelby GT350 can do when it rolls out onto the streets.